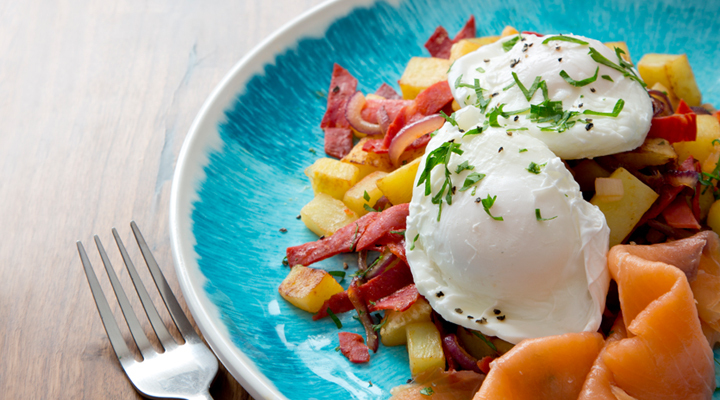 This chorizo hash is a delicious breakfast option and the perfect way to start your day. 1. Place the chorizo in a medium-sized frying pan set over a medium heat and cook gently for a few minutes, until the chorizo is starting to crisp up and release its oil. Add the sliced red onion and chopped cooked potato and fry for 4 to 5 minutes. Add most of the parsley and a pinch of salt and pepper. 2. Meanwhile, place a small pot on a medium heat with 4 cups of water and the vinegar. Bring to the boil, then reduce to a simmer. Crack in the eggs and poach gently for 4 to 5 minutes. 3. Divide the chorizo hash between two plates. Top each one with two poached eggs and the smoked salmon. Garnish with the remaining parsley and serve straight away.